Get 1/2 Off Your First Month’s Rent or Pay 1 Week and Get 1 Week Absolutely Free! 5 Reasons You Will Love Premier Rental Purchase! -If the item you like is not in stock at Premier Rental Purchase, we can order it! –Merchandise that is previously rented can be leased or purchased for REDUCED prices and terms. –90 Days Same AS Cash on all items, all prices, everyday. -Convenient and adjustable terms. You can renew you lease weekly, bi-weekly, or monthly. 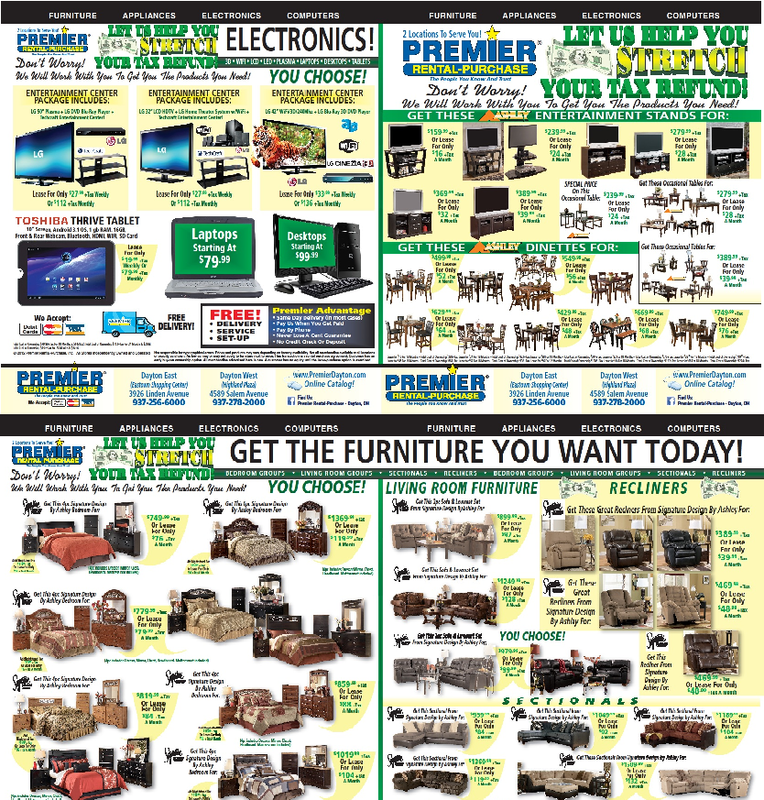 Visit us online at http://www.thepremierstores.com/ to learn about our “Internet Only Specials” and Monthly Promotions.Follow us on Facebook at www.facebook.com/daytonpremier. We have two convenient locations in Dayton to serve you. Dayton East is located at 3926 Linden Avenue in the Eastown Shopping Center. Call us today at (937) 256-6000. Dayton West is located at 4589 Salem Avenue in the Highland Plaza. Call us today at (937) 278-2000 or stop by our spacious showroom floor to see the largest selection of name-brand merchandise at the lowest prices!